The Affordable Care Act extends coverage under a parentsâ€™ plan for eligible adult children until their 26th birthday. 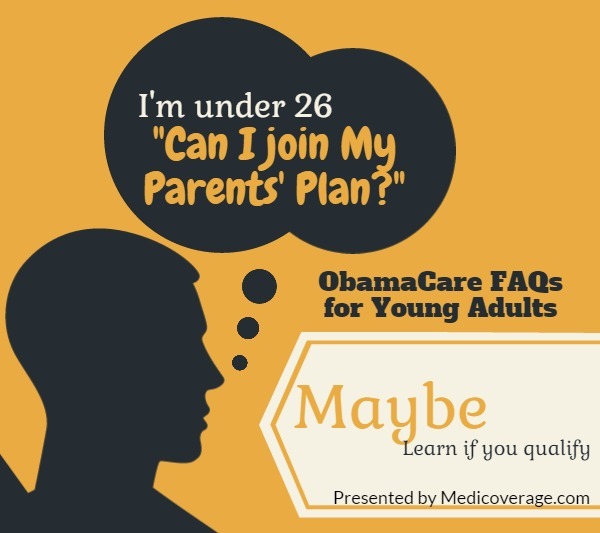 Here are some frequently asked questions about Obamacare coverage for young adults. 1) Do I Have to be a Dependent? No. The new law does not require an adult child to be a tax dependent in order to enroll in their employee sponsored coverage. 2) I am 21 and Married Can I Be Covered by my Parents’ Plan? Yes. The law allows both married and unmarried children to remain on their parents’ employee sponsored plan until they are 26. However, this will not cover your spouse or children. 3) I Have Employee-Sponsored Coverage. Can I Enroll in my Parents’ Plan? No. Your parent’s plan only has to cover you if you are NOT offered job-based insurance. So, even if it is more expensive you will not be able to enroll in your parents’ plan. 4) I Used to Have Job-Based Insurance. Will I Be Able to Enroll in my Parent’s Plan? Yes. You will be able to enroll or reenroll into your parents’ plan if you have lost your job-based insurance. 5) I’m Over 26. Can I Enroll in My Parents’ Plan? Maybe. Some states have extended coverage past the minimum age stated by the Affordable Care Act. However, there may be restrictions to this type of coverage. If you fall into this group and don’t meet the requirements you may want to apply for an individual health plan. 6) I Live in a Different State than my Parent. Can I be Covered Under Their Plan? Yes BUT you’ll probably be restricted to a network within your parents’ home state. While you would be covered for emergencies, you more than likely would not have coverage for doctor’s visits while living out of the state the plan was issued in. If this is your situation, you may want to consider one of the Exchange plans available in your state. You may even qualify for premium subsidies to help with your monthly bill, as well as cost-sharing subsidies to limit your out of pocket spending. If you are under 26 and want to learn more about which plans you qualify for call the number above or contact a Medicoverage agent.